There’s nothing better than taking your boat out on a beautiful day and enjoying yourself, but could your boat be safer, particularly if you have children? Specifically, think about the times when you are just getting back in your boat after some time in the water. It can be a challenge walking around on the slick surface. At times, it can even be somewhat unsafe. It’s why so many folks are choosing Marine Customs for marine non-skid decking. Marine Customs offers a variety of options for customers. We provide the highest quality custom-made nonslip pads for any boat. Traditional decking maintained a non slip surface by being coated with textured paint, molded with aggressive patterns in the deck, or covered with teak wood, affixed to the deck with screws and glue. However, each of these present drawbacks. Textured paint has a tendency to capture dirt and grime, making it nearly impossible to clean, and although it looks good, teak requires regular maintenance that increases as time goes on. In recent years, EVA foam decking has exploded in popularity. A major reason why is that unlike carpeted decks, once common on ski boats and runabouts, you can hose the EVA surface off with soap and water to keep it looking great. EVA foam decking doesn’t stop at the appearance, as you’ll read in the next section below. EVA foam cushions your feet and joints, reducing fatigue from vibration. It also acts to lessen sounds, a potential game-changer for fishermen looking to remain as quiet as possible. Boaters are often curious how long these types of non slip decking last. Based on how well you take care it, the average is between five and seven years. EVA is designed to be removable without much of an issue, and the “peel and stick” operation allows you to keep your glue or contact cement away from the process. Safety – You can feel confident that the swim platform pads offered by Marine Customs are made with safety at the top of the priority list. Our team only uses marine grade adhesive, which promotes incredible stability. Not to mention, it’s easy to install and covers spider cracks and other surface imperfections. Attractive Design – We understand that your boat is your baby, and we want to ensure it stays as such. At Marine Customs, there is no one-design-fits-all mentality. We work with you to provide customizable options that you will ultimately love. Take your pick from 16 available colors. Durability – When you choose swim platform pads and other boat decking options from Marine Customs, you’re investing in the lifetime of your boat as well. Plus, our products are stain resistant, allowing for easy cleaning and hassle-free maintenance. Your swim platform pad will last longer and look like new after cleanings. Don’t go another day on the water with unsafe decking. 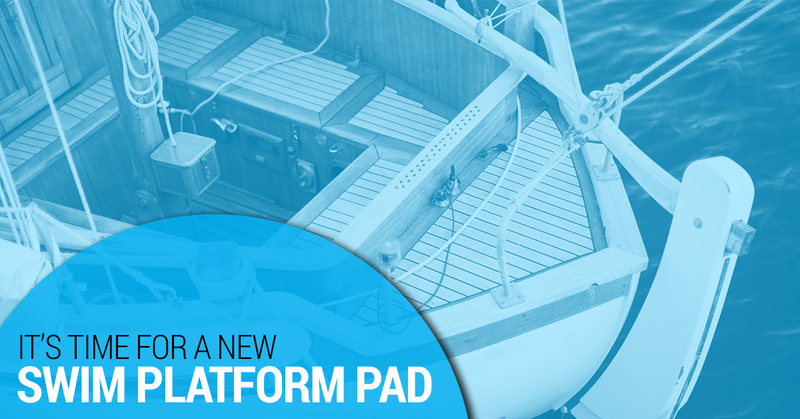 If it’s time for a new swim platform pad, contact the professionals at Marine Customs to get started with your customized non-skid marine decking in Florida.